Landscape Design and Landscape Construction, Inc.
Landscape Design & Landscape Construction, Inc. has designed and installed virtually every wall system available for residential and small commercial applications. 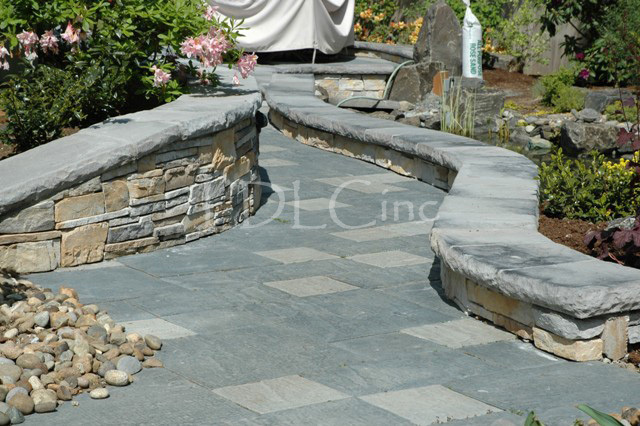 Retaining walls are a popular solution to stabilize hillsides, define grade, or create planters. While we have installed wall systems ranging from small garden walls to large engineered retaining walls, Landscape Design has the experience and expertise to apply the appropriate product line that meets your specific preferences and design criteria. Wood walls offer an effective retaining wall option by blending this natural material with the surrounding landscape. In contrast to the conventional use of treated railroad ties, well constructed walls using pressure treated wood ensures decades of strength and stability. The texture and general appearance of wood reinforces the connection between the natural environment and a specific architectural function. Often times, the use of a more architectural statement is required in the construction of retaining walls so that these features blend with those of the home or other structures. Whether a standard brick or river rock is used, this option is very effective in displaying a variety of finishes. The most successful application results from Cultured Stone products, which replicate the appearance of natural stones of all styles. As one of the most popular wall systems, modular concrete block walls give the owner several options to achieve a classy, efficient, and structural result. A variety of block styles are available, giving designers numerous choices as to the feeling and form the wall promotes while accenting the surrounding landscape. Using rock to retain slopes is a common and popular wall system. By interlocking large boulders together into a unified mass, rockeries are an economical and efficient method of soil retention. Rockeries can be used to blend the natural rock material into the remaining landscape by creatively incorporating placement rock or other natural unifying features.